Spectral imaging gives the spectrum for each pixel in an image, enabling efficient material identification, revealing hidden or faded features and detecting material degradation. Our spectral imaging device PRISMS is modular and able to image over a broad spectral range (UV, visible and infrared) at moderate or high spectral resolution and at high spatial resolution both close-up and at stand-off distances up to tens of metres. 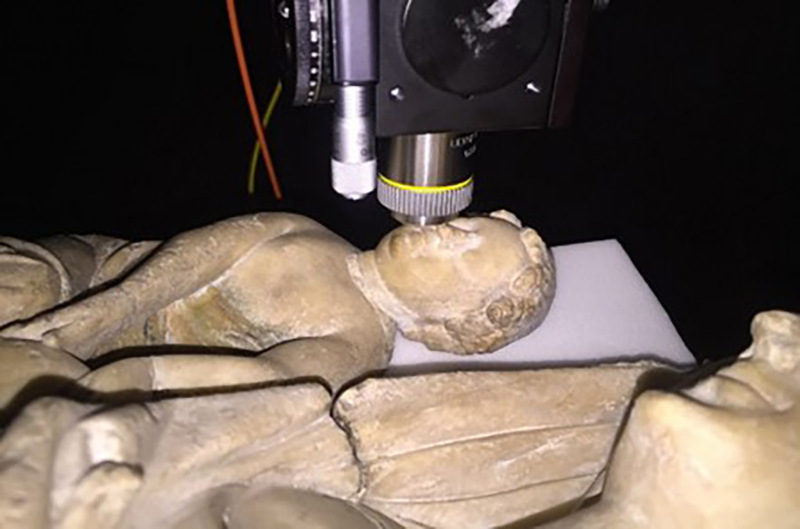 It can record simultaneously spectral images as well as 3D surface topography. 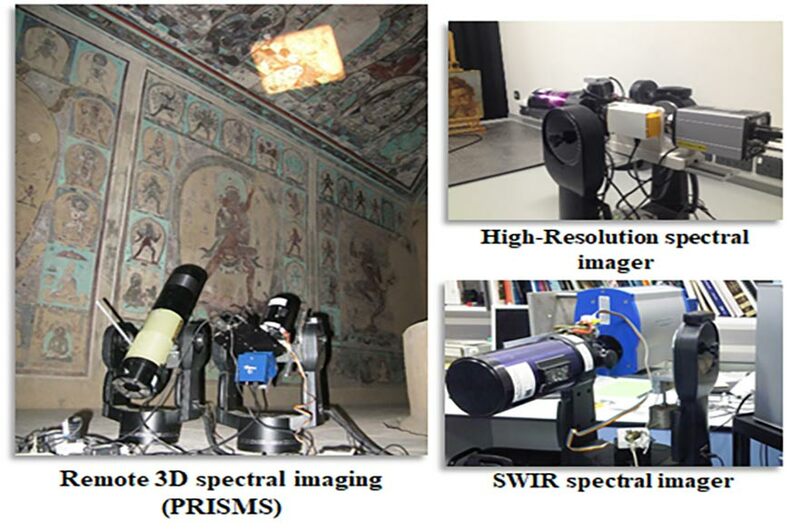 ISAAC is equipped with a portable and flexible FORS system for in situ measurements that complements visible/near infrared multispectral imaging by providing higher spectral resolution spectra with a broad wavelength range from 350nm to 2500nm. The handheld XRF provided from the ISAAC mobile lab can be used for in situ non-destructive elemental analysis. 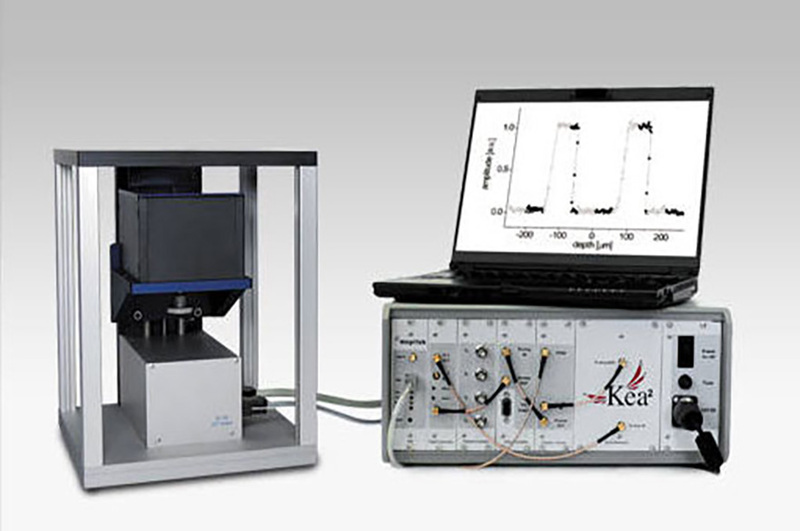 It is complementary to Raman spectroscopy and reflectance spectroscopy obtained from spectral imaging or FORS. Our small footprint FTIR spectrometer can be operated in reflection mode thus enabling in situ non-destructive measurements of mid-infrared reflection spectra. Assistance of pigment and binding medium identification. 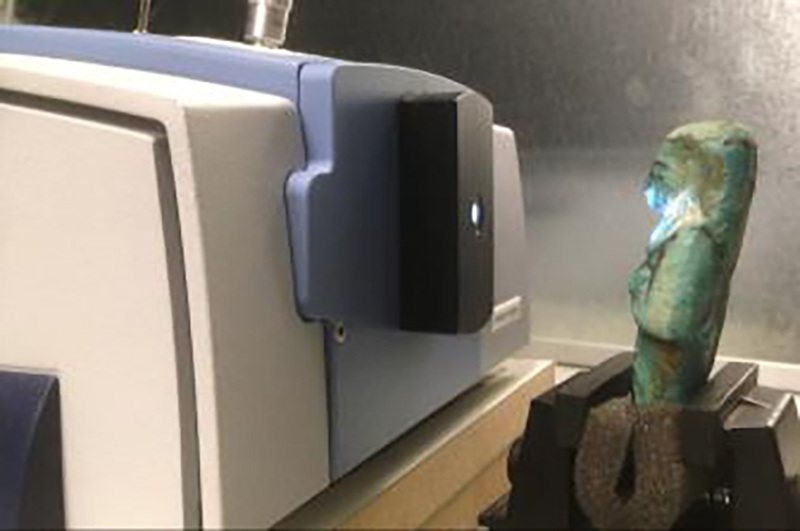 Raman spectroscopy gives very specific molecular identification. ISAAC is equipped with two in-house developed mobile Raman spectrometer at 780 and 532 nm capable of remote operation up to a few metres. 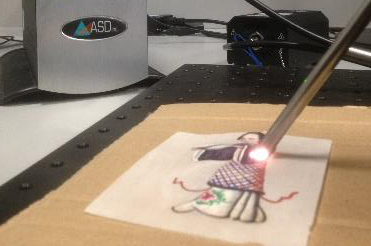 Non-invasive, highly specific identification of inorganic materials and some organic dyes. 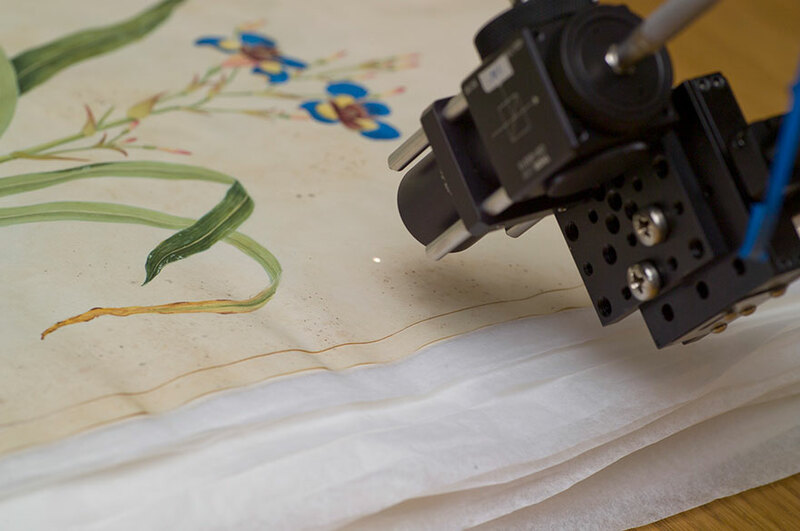 The in-house developed microfade spectrometer is used for in situ lightfastness measurements on an artwork by monitoring the reflectance spectrum and colour while fading a tiny sub-mm spot at high light intensity. Strictly speaking the technique is micro-destructive, but, no damage is visible even under a microscope. 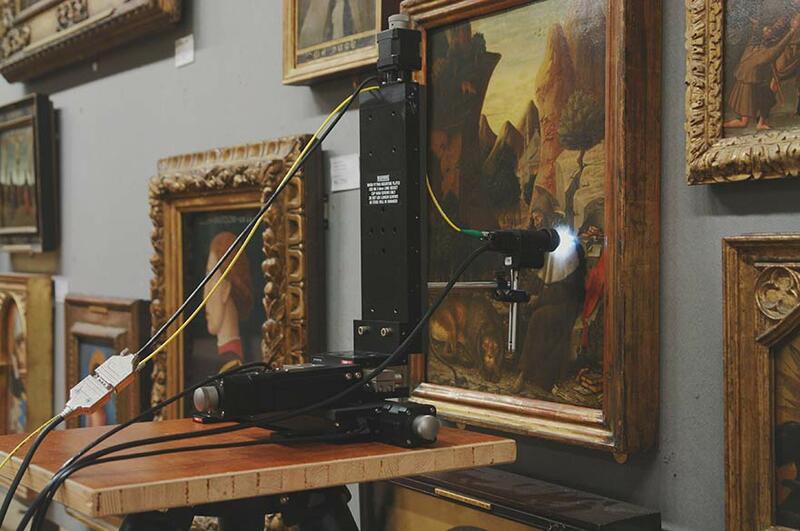 evidence-based risk assessments for the display of light-sensitive artworks. OCT involves fast, non-invasive, non-contact, microscopic imaging of subsurface cross-section and 3D tomography. ISAAC is equipped with a range of OCTs, mostly in-house developed systems, that range in central wavelength from the visible range to the near infrared (560nm, 810nm, 930nm, 1300nm and 1960nm) offering a range of specifications from ultra-high resolution (~1 microns) to deep penetration into highly scattering materials. This is a portable unilateral NMR sensor equipped with a permanent magnet geometry that generates a flat sensitive volume parallel to the scanner surface. The system can measure proton density (e.g. moisture content), T2 NMR relaxation times, T1 NMR relaxation times and self-diffusion coefficient of liquids. The scanner produces one-dimensional profiles of the sample structure in situ.